Chicago Bicycle Accident Lawyer | Illinois Bicycle Lawyers at Keating Law Offices: Bike Lanes Promote Safety For Bicyclists....AND Pedestrians. So is Chicago doing enough with its bike plans? Bike Lanes Promote Safety For Bicyclists....AND Pedestrians. So is Chicago doing enough with its bike plans? 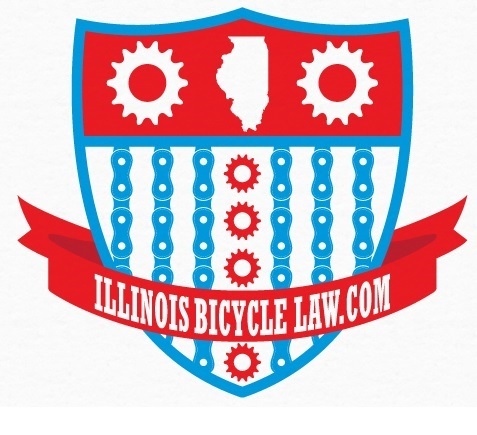 The Illinois Bicycle Law Shield. People for Bikes recently posted an excellent blog post from Michael Andersen, a Green Lane Project staff writer, about how bike lanes are just promoting safe bicycling, but also influencing safe conditions for pedestrians. Bike lanes are a part of a city's overall traffic planning that takes into account motor vehicles, bicycles, and pedestrians. In Chicago, with its densely populated neighborhoods and street layouts that date back to the rebuilding of the city after the Great Chicago Fire in 1871, traffic planning is a critically important issue for all citizens regardless of how they get around. Nonetheless, traffic planning is especially important for bicyclists and pedestrians because unlike motorists or riders on public transportation, bicyclists and pedestrians are especially vulnerable if they are involved in a bicycle accident. In 2014 alone, 8 bicyclists have died from a bicycle vs. motorist crash in Chicago. This is double the number of deaths in 2013. Also, so far in 2014, 23 pedestrians were killed when struck by a motorist. These numbers should concern every citizen of Chicago and raises the question: What is being done to reduce these numbers of deaths? Although Chicagoans need to be aware and alert of their surroundings and of the traffic safety laws, the City of Chicago's Department of Transportation has begun implementing various protected bicycle lanes to create a distinct barrier between pedestrians/bicyclists and motorists. These lanes are located next to the sidewalk curb and have physical barriers, such as parked cars and markers /poles to separate bicyclists from motorists. In 2011, Chicago installed its first barrier protected bike lane on Kinzie Street that was 1/2 mile long. This protected lane extends from Milwaukee Avenue to Wells Street and has increased bicycle riding by 55%. In 2012, Chicago installed a protected bike lane on Dearborn, which really focused on protecting those individuals who commute into the Loop via bicycle for work or leisure because it provides a direct route in and out of Chicago’s Loop. This Dearborn barrier protected bike lane extends from Polk Street to Kinzie Street. Then in 2013, Chicago installed the Milwaukee barrier protected bike lane, which is used by more than a thousand cyclists each day. This protected bike lane extends from Desplaines Street to Elston Avenue, and it too provides a direct route in and out of Chicago’s Loop. In total, the City of Chicago has 12 miles of barrier protected bike lanes. So the next question you may be asking yourself: Is that enough? With more than 4,000 miles of streets in the City of Chicago, the answer is no. Not only do these barrier protected bike lanes make bicyclists feel safer and provide a blockade from passing vehicles, these lanes also protect pedestrians from motorists. The protected bike lanes decrease the amount of roadway a pedestrian has to walk across, which means the pedestrian is walking across fewer lanes of vehicular traffic and has a higher likelihood of getting to the other side of the street safely. Also, protected bike lanes act as a signal to pedestrians as to which way traffic is traveling, that way pedestrians know when a vehicle is approaching and when it is safe to walk across a street. These barrier protected bike lanes also act as an additional walk signal for pedestrians—when bicyclists are given the green light to proceed in their protected bike lane, that gives pedestrians the “green light” to walk across Chicago streets safely. Barrier protected bike lanes also create an additional obstacle for those motorists who are always in a hurry. The protected lanes minimize the amount of swerving motorists are inclined to do to get around a stopped vehicle. Barrier protected bike lanes, if increased throughout the City of Chicago, could begin reducing the amount of bicyclist vs. motorist and pedestrian vs. motorist collisions and decreasing the number of bicyclist and pedestrian fatalities. The City of Chicago has made great strides in building its bicycle infrastructure, and has great plans, but it is of critical importance for the safety of bicyclists - and pedestrians - that these plans are continued. Lives depend on it.